This week Access All Areas members have a brand new premium icon set to download, courtesy of 1001FreeDownloads. This exclusive collection E-Commerce icons isn’t available anywhere else! It contains 37 graphics in a variety of formats, including vector AI, EPS & SVG, along with transparent PNGs. Use them to highlight call to actions within your web designs, or use them as design assets for infographics and projects with a monetary theme. 1001FreeDownloads scours the web in search for the best and most attractive free graphics for designers. They currently feature thousands of free vectors, photos, brushes, gradients, fonts and have much more to come. The 1001FreeDownloads site makes it easy to find the graphics you need with their quick and easy to use platform. 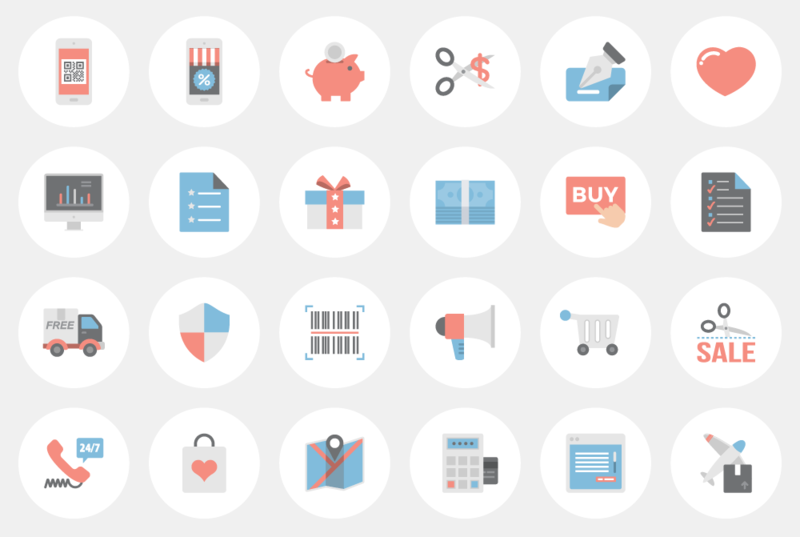 This exclusive E-Commerce Icon set has been created especially for Access All Areas members. It’s a collection of clean and flat icon designs that represent various actions relating to online shopping. Use the SVG graphics directly within your web designs, or resize the vector AI and EPS formats to any dimensions for use in any project!